This was another post that was originally on our blog Pan-Asian Kitchen. 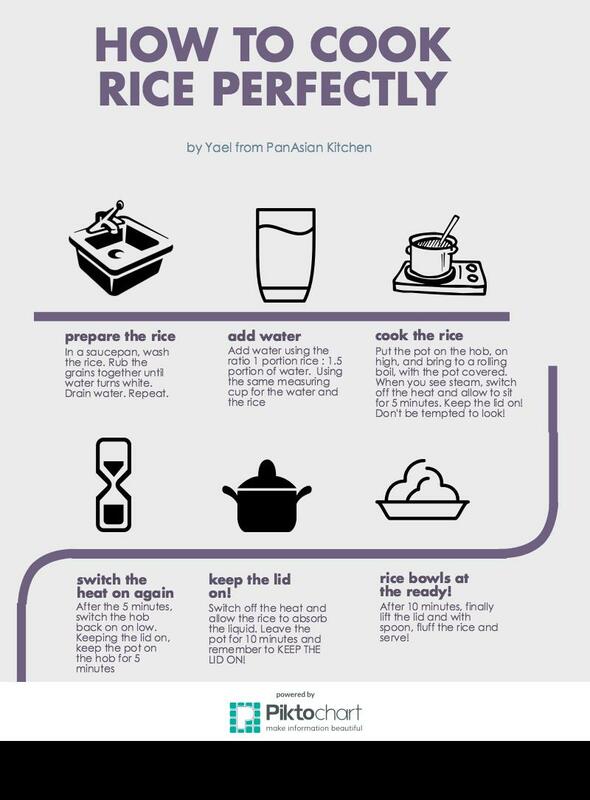 For anyone who fears cooking rice via the absorption method, I hope the the infographic helps you along! I thought an infographic would be useful. Cooking rice has always been a daunting task to a lot of people. But if you’re Asian, rice is a staple, so cooking rice is a skill that (should be) learned early. There are various ways to cook boiled rice. Some people boil rice and then drain the liquid. My mom taught me early and most Filipinos will use what is known in the rice bowl circuits as the absorption method. I love this method because, despite a lot of disbelief, the rice doesn’t stick to the bottom of the pan (even if you don’t use a non-stick pan). The steps are simple and I hope the infographic helps! Any questions, please leave them in the comments section. I’m definitely happy to help. This infographic is also downloadable! Click here.